Team Muckrach are gearing up for opening. With only a few weeks to go, Aidan, Rayner, Melissa and Matt are working hard at setting up the hotel. Tasks such as ordering the best coffee, sourcing local products, organising the bar, varnishing the floors and cleaning the whole hotel regularly are keeping them busy! The four of them have worked on this project collaboratively for several months. Meet Aidan, the Hotel Manager, he has worked with our family for over 3 years in Cheshire. Aidan, at 19, was originally employed as a Chef at the Coffee Shop at The Hollies during which time he showed passion & enthusiasm. The family recognised something else in Aidan that led him to becoming the Directors’ PA, a role which required a fast-paced multi-faceted attitude to work. Aidan managed this role well and never faltered in his passion and commitment to the role and business. He was the natural choice to develop further when we bought Muckrach, Aidan in his original role worked with the Directors to organise the renovation and the fixtures & fittings. Aged 22, Aidan is probably one of the youngest Hotel Managers in the country, offering a fresh approach to the hotel trade, we know he will be awesome. Alongside Aidan as a part of Team Muckrach, there is Melissa and Matt, Assistant Coffee Shop Managers from Cheshire. Both of whom have progressed in the businesses in Cheshire at a young age. Melissa began at The Hollies 6 years ago as a Barista in our 24 seat Coffee Shop, within 4 years Melissa became the Assistant Manager of our 100 seat Coffee Shop. Melissa’s knowledge and commitment to the business meant she was also a natural choice to help Aidan set up the Coffee Shop business at Muckrach for the next 6 months. Matt joined The Hollies in 2011 to help build the new 100 seat Coffee Shop, as Matt is mutli-talented he not only helped to build the Coffee Shop, he then went on to work in it and soon became an Assistant Manager due to his passion for the business and customer care. Matt has forged a similar pattern all over again, having helped to renovate Muckrach during 2014 and then is supporting Aidan in the set up of the Coffee Shop for the next 6 months. Heading up the kitchen team is Rayner Muller, a talented young Chef with several years under his belt at The Glenmoriston and The Drumossie in Inverness. Rayner has joined us as Head Chef with the drive to make a name for himself and the hotel through his ‘homestyle-cooking-with-a-twist’ menu! Rayner is now working alongside Johan his Sous Chef, who also comes along with great knowledge. We are very excited about the Coffee Shop & Restaurant experience that the kitchen team will create. The management team have been expanding the hotel team with some fantastic local people, whom we are all looking forward to working with. The whole team are working towards offering everyone a Highland welcome at Muckrach Country House Hotel. Muckrach is an 11 bedroom fully renovated boutique hotel with a Coffee Shop & Restaurant open every day for all to enjoy. 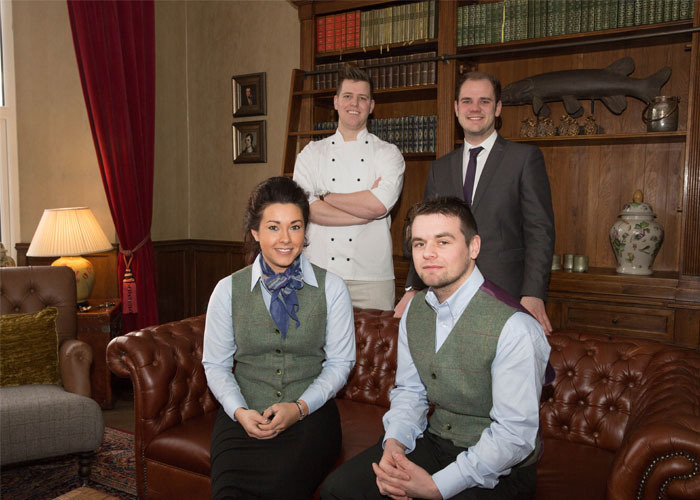 Aidan, Rayner, Melissa & Matt and their team look forward to welcoming you very soon.